Since the Obama administration finalized the historic 54.5 miles per gallon fuel efficiency standards in August of 2012, car manufactures have been scrambling to find new ways to increase the fuel efficiency of the vehicles they produce. The ambitions of auto makers to improve fuel efficiency took center stage at the 2013 Detroit Auto Show. Several manufactures showcased how new lightweight materials are being utilized to improve the fuel efficiency of their products. For the past century auto makers relied mainly on steel for the production of automobiles. In 2007, the average car contained 2,400 pounds of steel and the average pickup truck or SUV contained nearly 3,000 pounds of steel.1 Considering that most cars weigh around 3,000 pounds, 80% of the material used to manufacture a car is steel. Some vehicles on the road today are beginning to sport a handful of parts made from lightweight materials—for example the tailgate on the new Ford Explorer is manufactured from light weight magnesium. An increased use of light weight material in the manufacture of cars is guaranteed to increase significantly over the next several years. As with any new innovation in this day and age there are always drawbacks or concerns. The use of new lightweight materials in automobiles is a concern for the already struggling private automotive repair industry. At a recent WNY Automotive Technology and Energy Group meeting, several private repair shop owners voiced concerns about the cost of equipment and training that will be required to repair vehicles utilizing new lightweight materials. 1 George, Patrick E.. “Top 5 Materials Used in Auto Manufacturing” 05 October 2009. HowStuffWorks.com. <http://auto.howstuffworks.com/under-the-hood/auto-manufacturing/5-materials-used-in-auto-manufacturing.htm&gt; 23 January 2013. If you drive a General Motors (Chevy, Saturn, GMC, Buick, Pontiac, Cadillac) vehicle and have ever attempted to search for parts for your vehicle, there is a real good possibility the sales person helping you asked you about your vehicle’s options codes. If you have never experienced this question then by reading this post you are probably wondering what in the world I’m talking about. Don’t worry that is the whole point of this post. 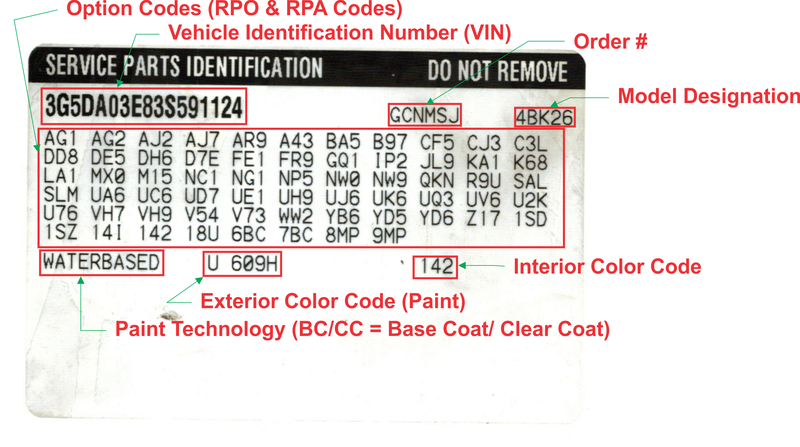 Since 1984, General Motors has placed service parts identification (SPID) labels on all of their vehicles. This label was designed to aid service and parts personnel in identifying parts and options originally installed on that specific vehicle. This label lists both Regular Production Option (RPO) and Regular Production Accessory (RPA) codes. These codes on your sticker will be identical to the specifications on your vehicle’s original build sheet from the factory. The codes found the tag are three digit combinations of letters and numbers. An example of one of these codes is FE3; this is a common suspension option code in GM vehicles. Ok now that you know what your Service Parts Identification (SPID) tag is and does, it’s time to find it on your vehicle. Finding your SPID tag can sometimes be a bit of a challenge. The most common hiding places for this label are, in your glove box, on the inside of your trunk lid, and/or on the bottom side of the cover for you spare tire in your trunk. On some of the GM SUVs and mini-vans the SPID label will be located on one of the plastic storage covers in the rear of the vehicle. I’m currently working on a vehicle specific list of SPID locations that I will be posting at a later date. It’s a good idea to know the location and understand how to read this sticker prior to ordering or inquiring about any parts for you GM vehicle. If you have any questions relating to General Motors Service Parts Identification (SPID) labels or any automotive parts questions, as always feel free to contact me at marksautoparts.socialmedia@gmail.com. Well there isn’t really any better way I can think to start this other then, “Welcome to our Blog.” More specifically welcome to the Marks Auto Parts Blog. Marks Auto Parts is a family owned and operated recycled auto parts supplier located in Buffalo, NY. Marks Auto Parts has been supplying quality recycled auto parts to its wholesale and retail (DIY) customers for over 60 years. My name is Daniel Marks; I’m a fifth generation Marks to be a part of the family business. I have been working for my family business since I was old enough to hold a wrench. My official title with our company is operations manager; which is partially accurate. I also spend a majority of my day ensuring that my family business keeps up with the ever-changing automotive recycling industry. The final part of my job, and also the reason I am writing this blog, is maintaining relationships with our customers and ensuring the best possible recycled parts experience for all of our customers. I am the primary contributor to the Marks Auto Parts Blog, but hope to invite several guest writers from the industry to contribute in the future. By this point I’m sure you are wondering what you can expect from our Blog. My plan for this blog is to give my customers an inside look at the auto recycling industry, my family business, and also to share automotive knowledge that can help you save time and money on your auto repairs. I plan on using this blog as a medium to share a wealth of information, and at any time you have an automotive repair or automotive recycling question or topic, or an experience you had at my store you would like to discuss please feel free to leave me a comment or send me an email to marksautoparts.socialmedia@gmail.com.